The number of Independent voters has increased dramatically since 1995. Depending on whose statistics you read the proportion of Americans registering as political Independents (or decline to state their affiliation) is currently between 38 and 40%; and this is scaring the hell out of both the Democrat and Republican Parties. But Thomas Richard Harry, author and third-party candidate for the U.S Senate in Missouri in 2000, is not afraid at all. In fact, in his latest book, “The Gathering of the Clan,” he takes pains to assert in a logical and persuasive way that the rising tide of Independent voters could very well be the best thing to happen to our society in a long time. “The Gathering of the Clan” is not a large book, nor does it take a Masters Degree in Political Science to understand. As a matter of fact, the author himself characterizes the book as “a book written by a pretty average American primarily for other pretty average Americans.” What the book does require, however, is that the reader pay careful attention to certain chapters that are in fact the foundation upon which the entire book rests. But how will you know when you are reading a foundation chapter? Don’t worry; the author is very careful to point them out and at times even suggests that you go back and reread them before moving ahead. At times I felt like I was back in college studying Political Science 101, but the exercise of reviewing the bidding from time to time is well worth the effort. “The Gathering of the Clan” is divided into three parts, which keeps the reader from losing his or her way while navigating through the book. In Part One Harry provides the “who, what, when and whys” of the Independent voters. As for “who” the Independent voters are, it becomes obvious that they are more than a statistical entity. In fact, they can be found in local organizations scattered across the socio-economic and geographical landscape. The “why” part is fairly straight-forward as well. It all boils down to failed expectations and a lack of viable options afforded by the two-party system. In Part Two, Harry shifts gears from talking about what Independent voters “could” do to what they “should” do. This is where the book really started to get my attention. Laying out his logic carefully, he draws the reader to the inescapable conclusion that there are only two Independent political options available: 1) “a nonelectoral shadow government; an organized, active, and visible interest group if you will, possibly in the organizational form of a think tank,” or 2) “a direct electoral challenge to the duopoly in the form of an Independent political party.” This is where the author drops the other shoe and opines that a third party is the way to go. Having established his preference for a third party Harry proceeds to describe how it would all work. The Independent political ideology would be based on a simple concept: “the greatest good for the greatest number;” and the platform would stress ways to return greater balance to our society. With an ideology and platform in place, Part Three goes on to discuss specific planks to the platform pertaining to special interest influences on the government; various tax issues; Social Security and Minimum Wage. The current dominant political parties in our two-party system are failing our country; that much is clear. “The Gathering of the Clan” doesn’t have all the answers; but it provides an excellent point of reference for promoting change. Kudos to Thomas Richard Harry for writing a thought-provoking self-criticism of America’s political system. It is a must read for all of us who care about America’s political future. 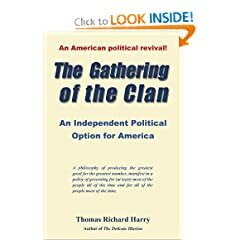 1 user commented in " Book Review: Gathering of the Clan by Thomas Richard Harry "
Independent voters exist in the United States because originally all voters in the United States were independent voters. There were no organized political parties in the United States until the election of 1800, when a political party started by Thomas Jefferson and James Madison took over the United States government, starting the two-party corruption that dominates American politics today. Independent voters are what remains of the electoral system established by the writing and adoption of the Constitution of the United States. Independent candidates like George Washington had been were prevented from being elected to high office after 1800 by the fact that political parties collected contributions from the citizens after the manner of Protestant churches which were used to pay newspapers for exclusive promotion of party candidates. Independent voters had no means of making their candidacies known to the public after 1800 in any way that could compete with the party propaganda that political parties could purchase for their candidates. Independent voters need to go back to square one and declare candidacy for the right reason, registration of voters, and become candidates who solicit no contributions, make no expenditures, seek no publicity, and have no expectation of being elected, but who register as many voters as they can. Independent voters now outnumber Democrats for the first time since 1800. They need to become candidates for office, not to get votes, which they will do, but to register voters. It is time to leave these two corrupt major parties behind.